DB9 brakes...what spacers you running? Hi folks just bought some DB9 brakes from AKS and just want to know what minimum spacers I'm need to run these....im going to be keeping my pescaras. I know people say they are the same as the ttrs variants but I've also read the db9 items require more spacing...ive tried having a quick look on here but I'm pressed for time so just wanted to see if anyone has a definitive for me...cheers in advance for any help/info. Re: DB9 brakes...what spacers you running? You'll need 12mm With the 340mm discs. Cheers mate nice one. I ordered 15mm before seeing this.. i'll be dropping to 12s tho... i noticed u upgraded to 362 2 piece and cut it down to 8mm...looks minted..may go this route further down the line. Brakes came this afternoon...got them on with some sun still to spare. Will stick some of my pics up ones photobucket or whatever is working. Millions of room well no need for 15mm spacers...12s getn ordered....not liking the stance just now and the rubbing is happening at some turns...and thats me raised my coiloverss another 5mm..will try stiffining it more at the front to forgo raising yet again but will prob need to happen. Is it rubbing on the arch liner screw? A lot of folk cut that tang off or fold it flat. No not rubbing on that i got rid of that as soon as the coilovers went on moons ago however it is still rubbing badly on the rest of the arch, i had to raise it again today and up the dampening...still no good. My 12mms come tmoro im not holding out these will make much difference...im genuinly rethinking these shld have researched more before buying but been a hectic week. I cooked my old brakes at knockhill Monday night to the point of no return. Update for anybody following this or interested. 12mm spacers are feckn close but there is clearance....tight tho. I fitted them leaving it at the same height as yesterday...a little bit better. Ive raised them slightly again and i will be doing my long drive home tnite so will have a better idea. 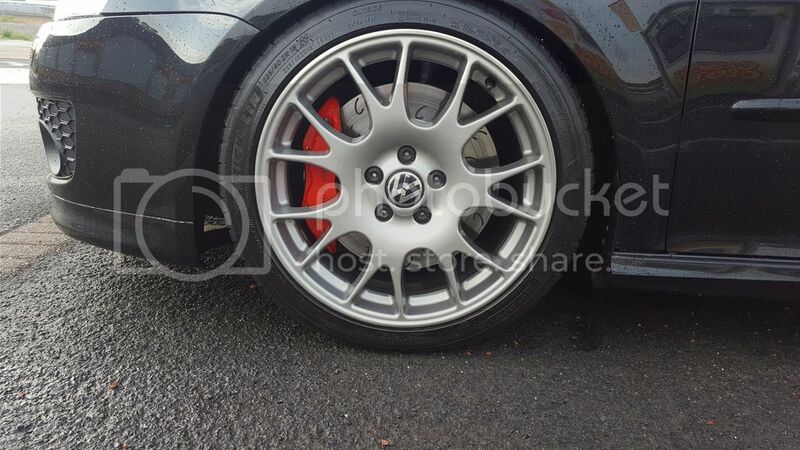 I know its only 6mm difference total across both wheels from 15s to 12s but even looks better. I will stick some pics up tmoro. Brakes look and work amazing must be said. Running mintax1155s. I have bedded them in as per procedure and they do seem good..not tracked or put under heavy use so cant review properly yet. Had a decent length journey home over a combo of a and b roads....Meh 12s still causing scuffing tho not as bad, the only solution is to raise the coilovers yet again FS..turning my dampening down as well once raised cos its absolutely solid too much for crap scottish roads. Brakes are great but due to the spacers required no use for anyone wanting decent lows on their car that want to use it on track or potholed/bumpy roads imo. Also havent got my alignment/geometry set up yet to compensate for the spacers/height adjust obv because im not yet decided on the final ride height required but the understeer and torque steer with these spacers on in the wet is shockingly bad. Does anyone know if the reyland kit requires spacers under pescaras and if so what size? Reyland have a 330mm AP kit which they claim works with OE wheels, presumably without spacers. A different set of wheels like TD 1.2 / Neuspeed / OZ Allegerita will however have a different internal spoke profile, which in combination with their typical ET45, will allow you to run with minimal or no spacers. All quite an expensive palaver and if you want to keep the OEM look with Pescara, then there is also the option of using the wider SRS Tech wings. Cheers mate. Yeah I seen that on their website but it's doesn't state spacers arent required just that they will fit under an 18" wheel...im assuming 18" monzas. I'm definitely wanting to keep the pescaras. You are right tho mate a bit of a palava but it's my own fault tbh I rushed in which isn't like me. I've had some time today to scroll through the forum and try and research a bit more. I need to compromise somewhere just need to sus out what I want more...and as it stands just now the wheel bling can take the hit...is anybody on here running the ap330mm setup that can give me a definitive on them under pescaras? Might even just go down the R32 route which I shldve just done the first time pfft lol. Presume you’ve done the arch liner screw mod already? More neg camber via SP balljoints or top mounts might also help. Do you know what caliper model the Reyland kit supplies? I feel your pain. I did this some years ago on a Corrado with an AP 330mm kit, which was quite a faff to fit. A change of wheels and ball joint grinding was required. Since that experience, I now prefer to make parts fit the car rather than making the car fit the parts, so I opted for the 340mm Clubsport S setup instead of 4-6 pot kits. Cheers mate thanks for that very handy link I think I will be doing some measurements and contacting AP about the CP9200 calipers (as advertised on reyland site). To be fair I would have been more than happy with the CS S setup you have as have read good things and your defo right what your saying I hate having to modify the setup to such a degree just because of the brakes..cannot stand spacers, never have...again my fault tho. Maybe will only do 3 track days a year at knockhill but it does pound your brakes around there. On a side note the brakes are immense both in terms of performance and looks (do not like the Aston logo tho bit cheesy for me tbh)...again not tracked them yet tho. It's very similar to the CP5200 I ran on the Corrado, which isn't a massive caliper, so you might be in luck My Corrado was a bit of a beast because it had a Garret GT35R turbo strapped to it, so it needed some brakes! The CP5200 on 330mm AP groove discs with Pagid RS15 pads was sublime. Really, really nice setup I got 60K out of the AP discs, worn way past their wear limit and still didn't fade or warp! The only reason I got rid of the Corrado was because I just couldn't get any parts for it! Either obsolete or on 1 - 6 month back order! I learned a lot on that car, especially with spacers, wheel weights and offsets, scrub radius and roll centres. In short, the factory get all of that right, so I've since avoided going too low and absolutely avoided spacers! I bet they are! They look the bizz with the J hook discs Shame they don't fit without spacers!